We’d love your help. Let us know what’s wrong with this preview of Mixed by Kip Fulbeck. Who couldn't love these photos of adorable kids? There is a picture of a child with the child's name and heritages listed. Occasionally there was a note or drawing from the child or a message from the child's parent. I didn't think there were enough pictures of teenagers. (It doesn't list ages, but I think there was just very few.) So this book won't really help give your awkward teenager self-confidence. The skin tones of the kids seemed to be lighter rather than darker. There wer Who couldn't love these photos of adorable kids? There is a picture of a child with the child's name and heritages listed. Occasionally there was a note or drawing from the child or a message from the child's parent. The skin tones of the kids seemed to be lighter rather than darker. There were tons of light skinned kids, but not as many dark skinned ones. The book needs more kids who look like Tiger Woods, President Barack Obama, or the President's two daughters. Beautiful portraits of some beautiful kids! As western cultural identities burst at the seams with demand after demand for more (rather, better) representative media for individuals of diverse ethnic origin or background, part of the challenge is to realize how overlooked the efforts of books such as these happen to be. Offering multi-ethnic children a glimpse of themselves is nowhere near as common as it should be. MIXED: PORTRAITS OF MULTIRACIAL KIDS entered my reading list for a handful of reasons. I'm a writer of minority ethnicity. I As western cultural identities burst at the seams with demand after demand for more (rather, better) representative media for individuals of diverse ethnic origin or background, part of the challenge is to realize how overlooked the efforts of books such as these happen to be. Offering multi-ethnic children a glimpse of themselves is nowhere near as common as it should be. MIXED: PORTRAITS OF MULTIRACIAL KIDS entered my reading list for a handful of reasons. I'm a writer of minority ethnicity. I seek to build my understanding of the visual and emotional dynamics of a melting-pot culture. I also have two nephews, both of which are multi-ethnic. From a publication such as this, my needs were simple, and thus, were simply met. At this point in time, I'm not interested in prolonged essays on the experiences of youths of whom must grow up while combating fragmented bigotry. 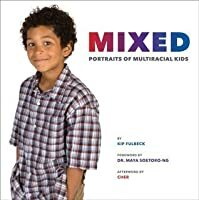 As such, MIXED: PORTRAITS OF MULTIRACIAL KIDS is a good find; no essays, no conversations, and few politics; the book is simply a collection engaging portraits. I know where to go if I want more dialogue on suburban diversity. But that's not what I want here, and thankfully, the book delivers. Fullbeck's work reminds me of a project by Martin Schoeller and Lise Funderburgdid for National Geographic, called "The Changing Face of America." In fact, I'm certain it was Schoeller's photography that nudged me in the direction of Fullbeck's book. The fact that there's no predictive measure available to articulate the wondrous and exciting diversity of eye, hair, and skin color/texture, beyond listening to these children in their own words, tells us something about the nature of ethnicity: Who you are and who you choose to become, though not always familiar and not always the same, are forever intertwined. MIXED: PORTRAITS OF MULTIRACIAL KIDS doesn't print out a family tree for each child, which is somewhat disappointing and can make it difficult to grasp how one child can identify with six different genetic ethnicities. But readers have to take the kids' (or their parents') word for it. The book also doesn't list the age of the children. I'm using this book for anthropological research as much I am to sharpen my cultural acuity, and I have no doubt I would have learned much, much more if the author had tagged each portrait with the child's age or stage of adolescence. Mixed: Portraits of Multiracial Kids by Kip Fulbeck is a photo essay on the many "faces" of multiracial ethnicity. The author strove to offer kids a chance "to define themselves" in their photos. The book includes a few of their written comments. It also includes commentary from many parents which addresses their personal life experiences around their own racial mixtures and how they hope their children's experiences will be better. Parents reveal memories of isolation, discrimination and being "othered." They hope this book will support their children so they do not feel alone, diminished, discredited, or discriminated. Author Kip Fulbeck wanted to advance the cultural conversation directed at people of mixed race beyond being perceived as exotic or aesthetically intriguing.He hoped to communicate one's uniqueness as a person beyond skin color and yet still recognize that race is a constant. I think the value of this book lies in the broad array of racial mixtures among the featured children. Kids will enjoy searching for kindred spirits as well as a sense that they are not the only one is racially mixed. Adoption-attuned Lens: often believe that their personal experience defines the experiences of others. This book introduces them to a vast array of racial mixes and encourages thinking, wondering about the experience of these other children. Kids can enjoy browsing this book simply to "see" the faces of diversity. They can also benefit from the potential conversations that it can open regarding both the gifts and challenges of a racially mixed heritage. This is a book that has been on my to be owned list for a while and when it finally arrived in the mail today I was over the moon and of course re-read the whole thing in one setting. So what makes this book so amazing? Well if some of you somehow missed this news flash, I am mixed. And I am married to a man who does not share the same racial heritage as me. So our kids will be even more mixed. Mexican, Native American, German, Caucasian, Irish, Austrian, Czech and Prussian to be exact. Growing up This is a book that has been on my to be owned list for a while and when it finally arrived in the mail today I was over the moon and of course re-read the whole thing in one setting. So what makes this book so amazing? Growing up mixed was interesting for me. While most of my life was spent in areas predominated by white culture, at 17 I moved into a household that primarily spoke Spanish and ate Mexican food everyday. In both areas I felt as many of the parents and Kip expressed in Mixed, that I was always pressured to chose one culture over the other. "Choose one" on the demographic forms. So what I loved about this book is how it embraces a new generation of mixed kids and paves the way for them that they don't have to choose one race over the other. They won't have to choose to identify with one race but can embrace their Heinz 57 of cultures and be proud and beautiful. If I had to pick one complaint with this book, it's that is wasn't as diversified as I'd like to see. A few mix combinations were displayed over and over again with some not pictured at all (Where are the strictly Latino/Caucasian kids?). Started reading this one while my awesome friendly neighborhood children's librarian was getting it ready to go out on the shelf. Beautiful photos, interesting little snippets of writing. It's time to recognize that we are all mixed, that you can't tell what someone is by looking at them, that a single label is neither accurate nor useful. I remember adding a check box for "human" on forms in the 80s. It was interesting to be reading Mixed and Shiksa at the same time. Soetero-Ng talks about bein Started reading this one while my awesome friendly neighborhood children's librarian was getting it ready to go out on the shelf. Beautiful photos, interesting little snippets of writing. It's time to recognize that we are all mixed, that you can't tell what someone is by looking at them, that a single label is neither accurate nor useful. I remember adding a check box for "human" on forms in the 80s. I am in a interracial relationship so when I spotted this book I knew it was a must buy. We do not have children yet, but already it has proven useful. When my niece and nephew look through it they love seeing kids that look like them as well as different. It has taught them that even when people look like them, they still have very different backgrounds. It is a valuable tool to spark discussion with little ones about culture and heritage. It made them very interested in exploring their own! A delightful, compact book of color photographs featuring multiracial children, some of whom are a veritable jambalaya of cultures (Cambodian-French-Romanian-Scottish-Native American-African American, anyone???). These lovely faces remind me of the many kids I see at work and walking down the street. It is a good reminder, too, never to take a face at...well, face value. There may be a lot more to the person underneath. A beautiful collection of photos and stories of American kids of mixed ethnicities. Adorable, heartening, fascinating, smart. Dr. Maya Soetoro-Ng's (President Obama's sister) foreword makes this more than just a pretty book - it's a place to see ourselves and our future. Beautiful portraits and beautiful stories. I was so glad to find this new book by the author of Part Asian, 100% Hapa, that I bought it right away! Usually I wait until books appear at my local used bookstore or check them out of the library. This is part of my research for the new blog THE MIX (www.mixemag.wordpress.com). I will review it and others about mixed ancestry this year. Can't say enough how much I love this book. This is the book I wish I'd had as a kid! I want to give it to all my friends who have mixed-race children. Had to leave the store, didn't have time to purchase, but I was glued to this book and the vignettes. The introduction by Dr. Maya Soetoro-ng (President Barack Obama's sister)is maybe even better than the book chock full of adorable kids. Just sayin'. It was fun to flip through this though I think it was less interesting, less funny, less touching... I guess for me just a generally lesser version of Part Asian, 100% Hapa.